I’ve been doing some advance study for teaching at my local church. I’ve been looking at what the book of Psalms teaches about prayer and stumbled on this unique take on the Psalms from preface to a commentary on the Psalms by Bono. Give it a read, and I think it will open up an appropriate and unique perspective about the Psalms. At age 12, I was a fan of David, he felt familiar…like a pop star could feel familiar. The words of the psalms were as poetic as they were religious and he was a star. A dramatic character, because before David could fulfill the prophecy and become the king of Israel, he had to take quite a beating. He was forced into exile and ended up in a cave in some no-name border town facing the collapse of his ego and abandonment by God. But this is where the soap opera got interesting, this is where David was said to have composed his first psalm–a blues. That’s what a lot of the psalms feel like to me, the blues. Man shouting at God–“My God, my God why hast thou forsaken me? Why art thou so far from helping me?” (Psalm 22) . . . Abandonment, displacement, is the stuff of my favourite psalms. The Psalter may be a font of gospel music, but for me it’s in his despair that the psalmist really reveals the nature of his special relationship with God. Honesty, even to the point of anger. “How long, Lord? Wilt thou hide thyself forever?” (Psalm 89) or “Answer me when I call” (Psalm 5). Psalms and hymns were my first taste of inspirational music. I liked the words but I wasn’t sure about the tunes . . . Still, in an odd way, they prepared me for the honesty of John Lennon, the baroque language of Bob Dylan and Leonard Cohen, the open throat of Al Green and Stevie Wonder–when I hear these singers, I am reconnected to a part of me I have no explanation for…my “soul” I guess. Words and music did for me what solid, even rigorous, religious argument never could do, they introduced me to God, not belief in God, more an experiential sense of GOD. Over art, literature, reason, the way to my spirit was a combination of words and music. As a result the Book of Psalms always felt open to me and led me to the poetry of Ecclesiastes, the Song of Solomon, the book of John…My religion could not be fiction but it had to transcend facts. It could be mystical, but not mythical and definitely not ritual…Anyway, I stopped going to churches and got myself into a different kind of religion. Don’t laugh, that’s what being in a rock’n’roll band is, not pseudo-religion either…Show-business is Shamanism: Music is Worship; whether it’s worship of women or their designer, the world or its destroyer, whether it comes from that ancient place we call soul or simply the spinal cortex, whether the prayers are on fire with a dumb rage or dove-like desire…the smoke goes upwards…to God or something you replace God with…usually yourself. Years ago, lost for words and forty minutes of recording time left before the end of our studio time, we were still looking for a song to close our third album, War. We wanted to put something explicitly spiritual on the record to balance the politics and romance of it; like Marley or Marvin Gaye would. We thought about the psalms…”Psalm 40″…There was some squirming. We were a very “white” rock group, and such plundering of the scriptures was taboo for a white rock group unless it was in the “service of Satan”. Or worse, Goth. “Psalm 40” is interesting in that it suggests a time in which grace will replace karma, and love the very strict laws of Moses (i.e. fulfill them). I love that thought. David, who committed some of the most selfish as well as selfless acts, was depending on it. That the scriptures are brim full of hustlers, murderers, cowards, adulterers and mercenaries used to shock me; now it is a source of great comfort. 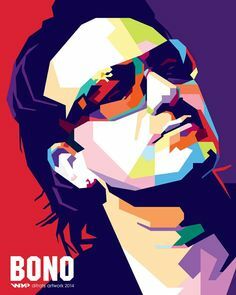 “40” became the closing song of U2 shows and on hundreds of occasions, literally hundreds of thousands of people of every size and shape t-shirt have shouted back the refrain, pinched from “Psalm 6”: “How long (to sing this song)”. I had thought of it as a nagging question–pulling at the hem of an invisible deity whose presence we glimpse only when we act in love. How long…hunger? How long…hatred? How long until creation grows up and the chaos of its precocious, hell-bent adolescence has been discarded? I thought it odd that the vocalizing of such questions could bring such comfort; to me too.